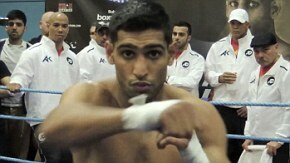 Amir Khan is to do battle with Floyd Mayweather in the richest fight ever to involve a British boxer. Bolton’s former Olympic hero will meet the greatest pound-for-pound fighter in the world in Las Vegas on May 3. Khan’s share of this $200million blockbuster is expected to be no less than $6m and is likely to climb to at least double that from pay-TV sales on both sides of the Atlantic. 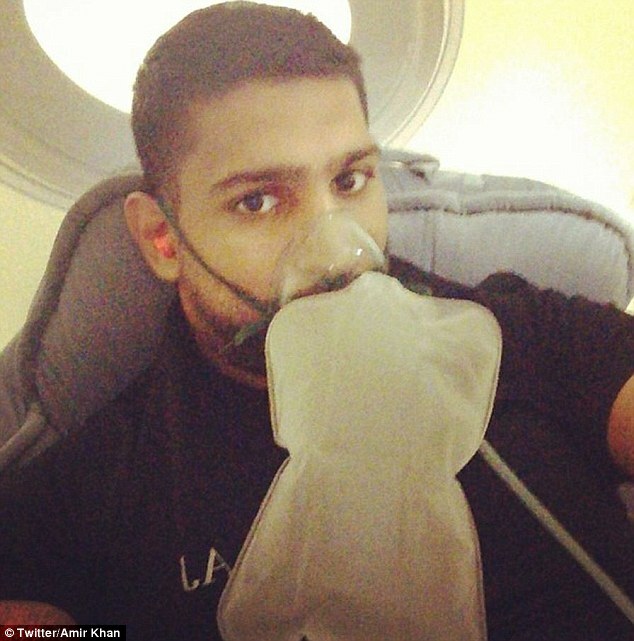 Breathe it in: Amir Khan posted this Instagram picture on Wednesday night showing him taking in 95 per cent oxygen from a mask when recovering from training. The mask produced five times as much oxygen as breathing normal air. Just sitting in the oxygen chamber produces 41 per cent oxygen. 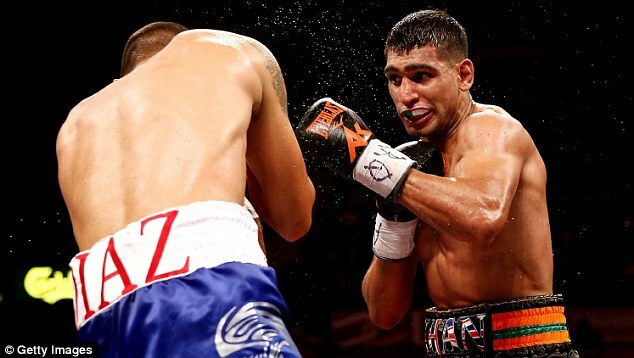 The official announcement will be made in the next few days and Khan has already pulled out of his challenge to world welterweight champion Devon Alexander, scheduled for December 7 in New York, to ensure that his dream fight with Mayweather is not jeopardised. Khan is being given this opportunity of a lifetime thanks to a conviction in America that his exceptional speed will present a unique test to Mayweather, who has dealt imperiously with all threats from bigger and supposedly stronger foes. 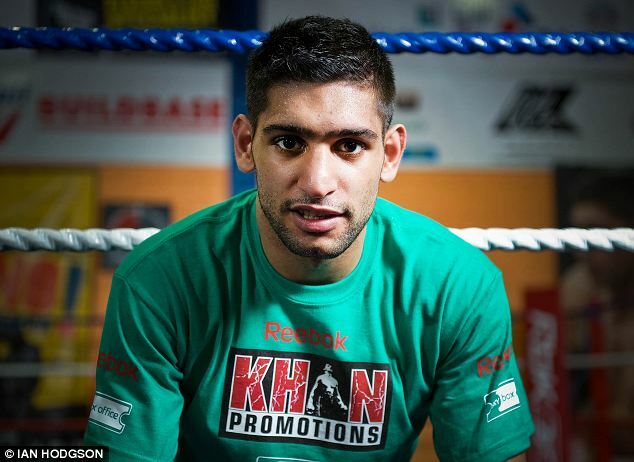 Khan had already begun preparing in California to face Alexander and will remain almost permanently in camp there with his new trainer Virgil Hunter for the next seven months. Mayweather had expressed interest in fighting at Wembley but reliable sources in America confirm that prospect has been discounted on financial grounds. Not only would an early-afternoon timing in the US compromise pay-per-view takings there but even a live gate of 70,000 at the stadium would generate revenue of no more than £7million. There are also significant tax benefits from boxing in Nevada. Mayweather’s master-class victory over Canelo Alvarez broke the $20m (£12.5m) barrier for ticket sales at the MGM Grand Garden Arena in Vegas, while Showtime pay-per-view subscriptions reached $157m… and rising. 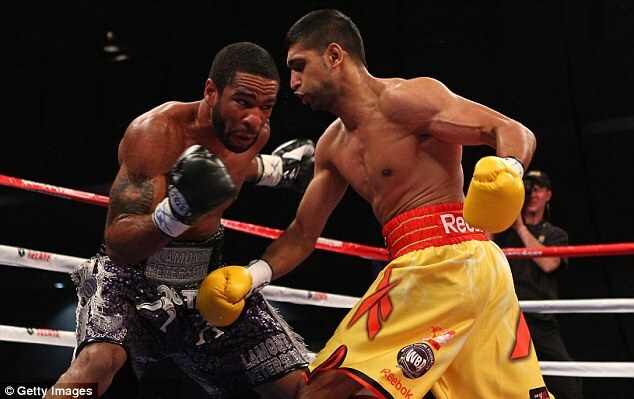 Khan’s chance comes even though, as a two-time world light-welterweight champion, he lost his belts in successive bouts with Lamont Peterson and Danny Garcia. Even though he has redeemed himself with comeback victories over Carlos Molina and another former world champion, Julio Diaz, he will be viewed in some quarters as jumping the queue to board the Mayweather money train. However, the ring’s newest mantra is ‘speed kills’ and Golden Boy, the promoters of both men, will be using that special asset of Khan’s as a foundation of the massive marketing campaign to come. That will include a TV documentary series, with the episodes focusing on Khan providing an exotic and fascinating insight into the life and times of the world’s pre-eminent, newly-wed Asian boxer. 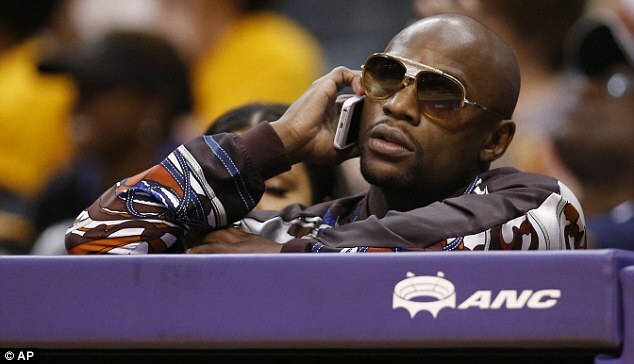 There will also be a multi-city promotional tour in the new year, which will bring Mayweather to Britain. Initial public reaction is likely to be that Khan has little chance against the the superlative ring craftsman of his generation and he will enter the betting as a heavy underdog. Those odds are likely to shorten, however, as boxing weighs up all the factors surrounding the most extraordinary evening of Khan’s existence. 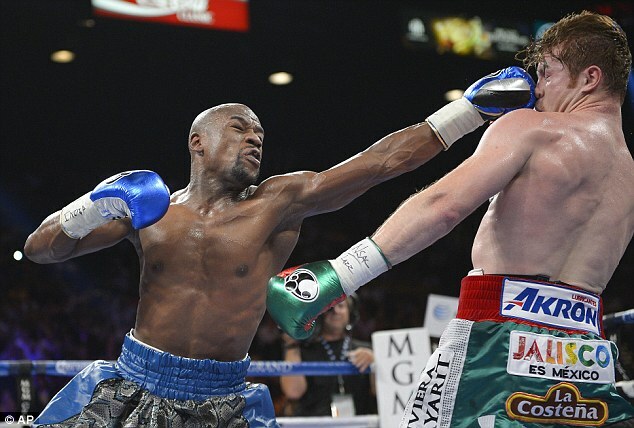 While Mayweather is nothing short of being a genius in the ring he struggled in the early rounds against the speed of Zab Judah – who Khan KO’d in six – before securing a points victory. 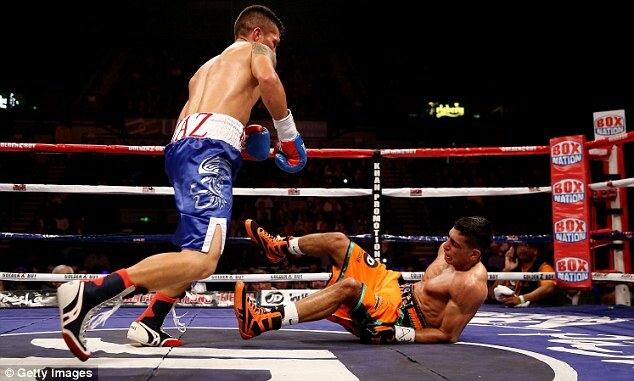 Nor is he a one-punch knockout artist like the two men to have stopped Khan, namely Garcia and Breidis Prescott. 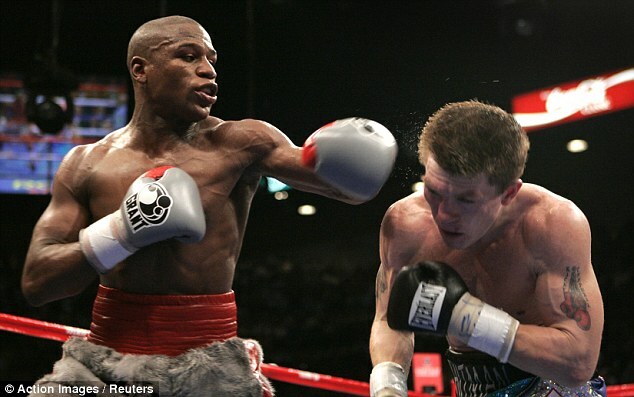 Mayweather is more a cumulative puncher and when he stopped Ricky Hatton six years ago the concussive effect was compounded by Manchester’s Hitman striking his head against a corner post as he went down. Then there is the age factor. Khan, who will be 27 in December, is 10 years younger than Mayweather, who has announced that he is in the final stages of his career. This will be the third in his series of six fights with Showtime on a contract expected to net him more than $200m. He has banked $41.5m from his virtuoso performance against Canelo, with more to come when figures are in for overseas TV and merchandising revenue. It is unclear whether he will box on beyond the end of that contract in the autumn of 2015. That decision is likely to depend on whether he shows signs of slowing down. Older boxers can hit the age barrier at any moment, virtually without notice. 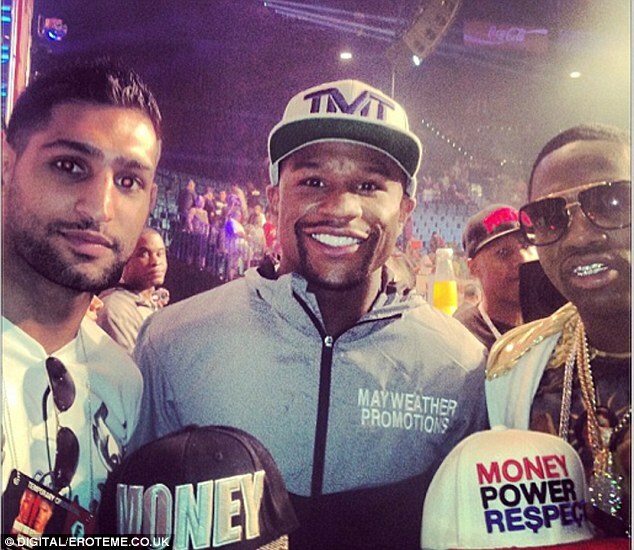 While that is unlikely to afflict Mayweather as early next May, the interim does give Khan the time to be in the most potent condition of his life. He will have to remain grounded through the star-spangled hype which will precede this happening of immense sporting magnitude, complete with its chat show appearances on network television. And where Alvarez whipped up the support and hard cash of tens of millions of his Mexican fans, Khan will be expected to excite massive interest in Asian communities in America, Britain, the Middle East and across the world. No matter how wary the British reservations may be about his chances of dethroning the great Mayweather, there is certain to be a trans-Atlantic invasion of Las Vegas next spring. 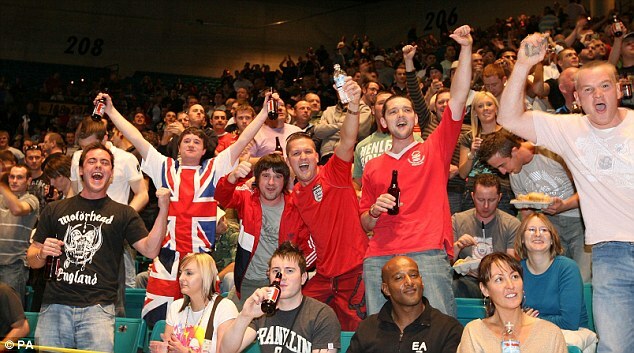 While the number of supporters following Khan may not reach the 30,000 who made the pilgrimage for Hatton’s tilt at Mayweather in 2007, the British interest seems certain to push the MGM gate revenue record for boxing in Nevada even higher. 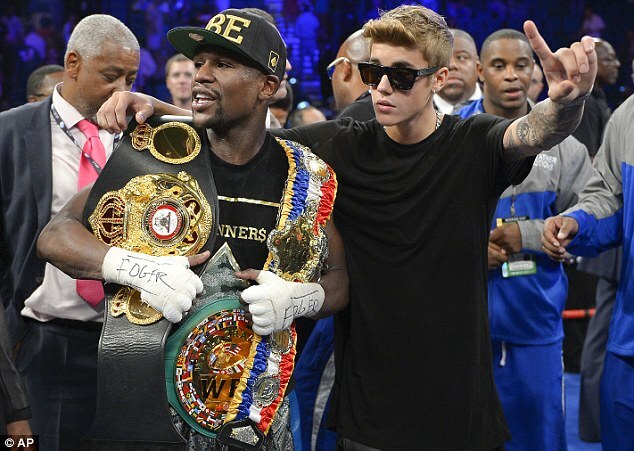 And, in one crucial sense, the belief that Mayweather is omnipotent works heavily in favour of our highest profile ambassador for Anglo-Moslem relations. 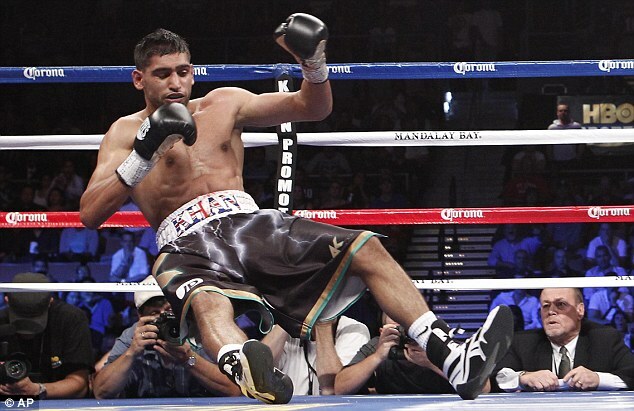 Khan is totally convinced that his speed and skills can overcome Mayweather. Even if he fails in that ambitious bid for ultimate ring glory, no-one will think any the worse of him. And if he were to lose heroically in a terrific fight he will enjoy enormous exposure and acclaim around the world – with his market value for future world title challenges as significantly enhanced as his experience of the mega-occasion. This, for Khan, this, is a no-lose situation.